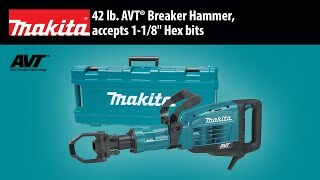 Makita’s hard-hitting HM1317CB 42 lb. Breaker Hammer is engineered for heavy chipping, demolition and breaking applications, but with less vibration for increased user comfort. The HM1317CB is equipped with Anti-Vibration Technology (AVT®), an internal counterbalance system that is engineered into the tool for more effective vibration reduction. It is an ideal solution for heavy structural demolition like breaking up driveways and sidewalks, as well as for landscape and trenchwork, asphalt removal, driving ground rods, and more. The HM1317CB has a 14 AMP motor that delivers 730-1,450 BPM and 34.9 joules of impact energy. It features Makita's electronic controller so users will benefit from the soft start, as well as a variable speed control dial, an L.E.D. service light that notifies users before brushes need to be replaced, and constant speed control that automatically applies additional power to the motor to maintain speed under load for the most challenging jobs. For added convenience, the HM1317CB has a 16.4 ft. cord and accepts the popular 1-1/8” Hex bit type. Net Weight : 41.9 lbs. Shipping Weight : 60.39 lbs.